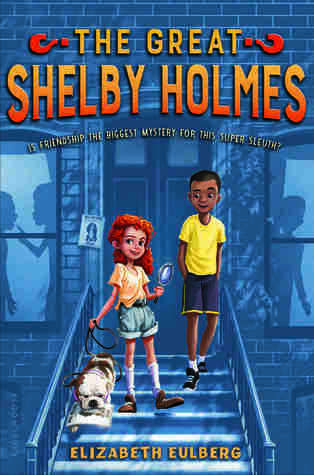 Meet spunky sleuth Shelby and her sports-loving sidekick Watson as they take on a dog-napper in this fresh twist on Sherlock Holmes. Shelby Holmes is not your average sixth grader. She’s nine years old, barely four feet tall, and the best detective her Harlem neighborhood has ever seen—always using logic and a bit of pluck (which yes, some might call “bossiness”) to solve the toughest crimes. Such a cute story! I picked this up mainly because I love all of Elizabeth Eulberg's books and I was curious to see her foray into middle grade. Plus, I'm a big fan of the Sherlock Holmes stories. And this book was just what I expected. Shelby is a pretty typical modern Sherlock Holmes. A cold genius who is hiding a loneliness deep under her gruff exterior. So much so that she doesn't realize that she needs John Watson until they've been hanging out for awhile. John is also pretty typical, but he's more of a happy-go-lucky, let's be buds type. Not as gruff as the BBC John - but of course he's a kid. Rather than John being a former army doctor, it's his mom. They just moved to New York, so John is eager to discover the city and to make friends. Like all iterations of John Watson, he's a simply, nice guy - not overly exciting. Shelby/Sherlock is the one meant to stand out. The mystery was very cute. A classmate's dog has been kidnapped only a few days before it's supposed to appear at an important and valuable dog show. I also liked the references to the other cases Shelby has solved. They were fairly mild (no murders), but definitely some crimes you'd have police investigating. Shelby has real skill as a detective already. The big mystery at hand was written well. There were several twists and turns. I did guess the culprit, but it wasn't super obvious and I'm guessing a younger reader would be surprised. My only complaint about this book is that the way John talked to other boys didn't sound realistic to me. It sounded like the way 18 or 19 year old guys would talk to their buddies. Not the way 11 year old little boys would talk. But then I haven't been around a lot of 11 year old boys, so perhaps I'm wrong. Or perhaps Ms. Eulberg hasn't been around many 11 year old boys either... So it's not necessarily a valid criticism, because I do not have an area of expertise - but it took me out of the story whenever it happened (thankfully it wasn't often). It looks like this is going to be a series, and I'm definitely excited to read more. Sounds cute! I didn't know she was also writing MG. I didn't click with her YA books, but I'll give her MG reads a shot.